Yeah, didn't go well here either. Oh well, thats what happens when taxpayers are the minority. I did what I could do yesterday. Now I'm gonna live my life. "Oh Bother!" said Pooh, as he chambered another round. Hi guys. First trip to the campfire. Ok after 14 pages Y’all ain’t right. Next I am so bummed at the election results on both a state, Wolfe, Casey, and a Federal level I am sick. Hey Jack how about some pics of that 39 to cheer me up. No! I don't like you anymore. YOU let that Wolfe guy stay in politics. OK, I'm sorry little buddy.....I'm going to put a tang sight on it, test it again ...for accuracy...and post a few later. a Pennsylvanian who has been accused of clinging to my religion and my guns......Good assessment skills. Yep so enough about politics this ia a good times tread, there`s a politic forum for that. Welcome to the fire Tycer and Fordwannabe. Cold here this morning so we fired up the big out door stove, awe that wood heat feels good. Griff my man! Where have you been hiding? Been waiting for the good guys to hang out over here. I tell ya, it's a party everyday here. Pitchy is the ramrod here and the rest of just follow his directions. Sometimes he is out patrolling with the M-1 and he will leave a designated person in charge. Couldn`t help myself and ordered a can, thanks again pard. There was another round of the older Greek surplus that came in not to long ago. It's dirty but non-corrosive and pretty accurate. I've gone through a couple of cases of their .303 British. Don`t tell me i made a mistake, it`s good ammo for the Garand right ? Sorry, didn't mean to make you nervous! My issue was with how the add read. "Possibly corrosive", "Possible mixed origins", that kind of thing puts me off. Try a few rounds and see how it shoots, check the primers and clean the snot out of it when you're done. My buddy, the "other Gunny" bought a 1000 rds of the surplus Greek ammo some years back and he told me it was the most accurate ammo he ever shot out of his 03A3....period, any ammo. He took it to Camp Perry for the championships and used it in competition. It MAY be corrosive . probably not as most countries gave that up by the fifties. Even if it is, that don't mean nothing. It's the primer that's corrosive. It leaves a film that attracts moisture. So.....that means you clean it the same way you clean blackpowder guns...a water based solution. Ballistol works great and if you don't have that just use a detergent soap and after you clean it, work a few patches of regular Hoppes #9 with a few swipes with a brush ...the same way you clean any other gun. 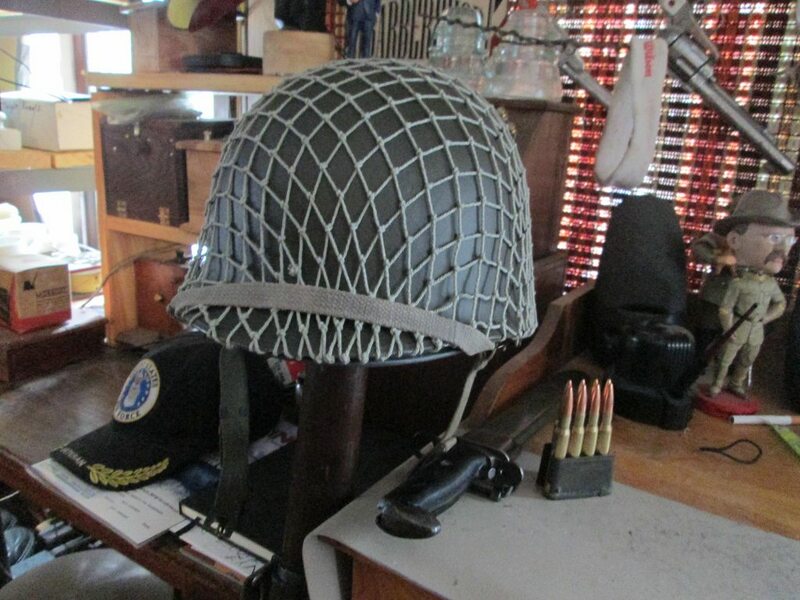 I've used lots of WW2 corrosive ammo in my National Match Garand with no ill effects. Also, after cleaning the barrel, clean the inside of the action, operating rod, gas system to get the corrosive film out. No big deal...people read into that too much. I've even used that ammo in the BAR. Now, THAT rifle is a real PITA to clean...right. Tom.....the Marlin shoots super. Has a perfect bore with a 2 pound trigger, flawless operation. Here's a couple of quick pics. Gee wiz guys I get up go to make some saw dust come home and PAGE 15!! I'm glad someone was productive today!! Six that 39 looks right nice! Shoots purdy good too. Nice to see Tom, Tycer , Paladin and Griff showed up- welcome fellers! There is only one Earth. Do it a favor? GET OFF. 250 Savage: The Original short action, compact, high velocity cartridge. darn Jack. That’s nice. I need to be near you and get a cull or two out of that funnel. I call the 6am- noon shift!! That way I can go fishin or grouse hunting afternoons! 6 HOUR shifts? WOW, that seems an awful lot like a j.o.b.... I was a squid... 4 hour watches are plenty... I'm with Tom... I need to be on the same schedule as Six... his culls would be treasure with me! Hey that's fine with me-4 hour shifts it is!! Oh joy a mass shooting in Thousand Oaks CA. JUST WHAT WE NEED! I need a cup of Blackrifle Coffee! Nice Marlin, Six! Shooter too. I know you asked for pics of this years hardware. Here are two from yesterday afternoon. The view is from the seat where my dad shot his deer last year. North central part of our lot. Major h3ll hole out in front of me for about the next eighth mile. I'm with you there. Our dogs are all goofed up this year, been getting me up at 4am all week. Nice looking Winchester, Jay. Hope you get one!! Cool pics Jay hope ya bag one soon. Gaurd duty is only one hour before dark and i can`t wait until its over. Morning gents. I am at my buds house this week archery hunting out at 0520 this morning only saw a Momma and a fawn so watched them for several minutes then we came in until the afternoon hunt. Got a new helmet net. Nice picture Jay....there's just something about being in the woods......a sense of calmness that no other environment can bring. The Colt is nice but......but.....ok, forgive me, I like the Winchester too.....but......neurosis kicking in.....after Winchester shortened the forend..or moved the band closer to the muzzle....did a disservice to the looks of the rifle....still nice. Jay, it dont mean I like YOU any less...it means I would like the rifle MORE if it had the long forend. Jason and Gunny with their dogs....yep. It's a great thing with animals. Yea...they don't know time, good for them.....but....on the other hand, I don't know time either since I retired....oh love it..got to bed around 3 after watching a ww2 movie on You Tube. Got up at 1. Today fellars we made a floating beam catapult, picture and vids below. Pitchy that's great! We are gonna have to change the name to garand& catapult campfire! We I spent the wrestling with big hunks of cedar. 8x10-16' long and 6x6's. This is part of a complete entryway. Tomorrow morning install 8x8 posts under the corners. ( rain for the afternoon)Then monday I can start the upper decorative parts. Cool catapult Lenn. Gene, my 9 year old Grandson enjoyed the video. Currently living my eternal life. Thanks Gunny and Ron, it was kind of a pain in the backside build but glad it worked and ya enjoyed it you guys are the only people that see this stuff not many in my area give a chit. Looks like a lot of work Gunny but you do beautiful work. Thanks Lenn, your work is impressive as well! 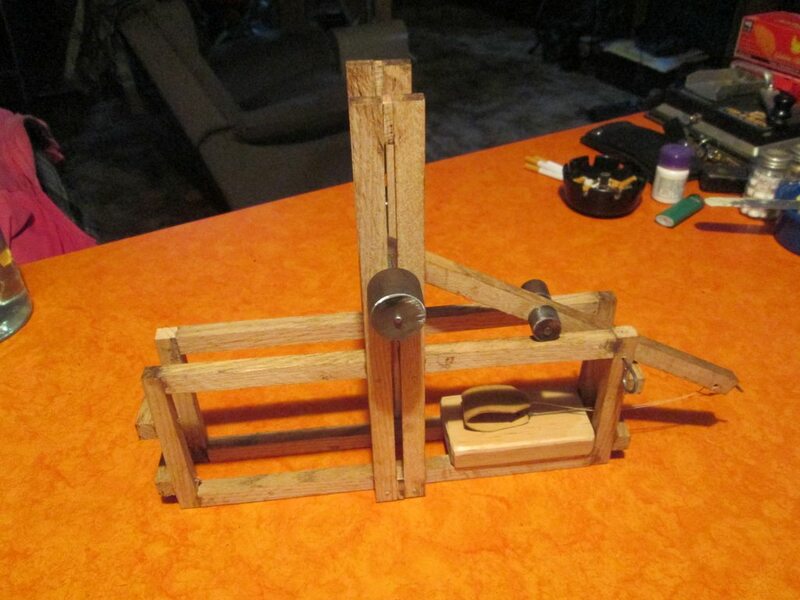 I might have to try making my own catapult, then I can fling kibble to the girls! Also the power can be increase greatly by lifting the weights to the top, i forgot to mention that. That is really cool Pitchy.....I guess that is an improved version of the other. I still say we need to make one that throws engine blocks but it would not be cheap. About 75 miles south of here, in Delaware, they have these pumpkin chucking contests. Don't know if they do it anymore as some crybaby claimed he got hurt and sued the farmer and the promoters.....yea, there's always a liberal that screws it up. I got tired writing this post and decided to take a nap. Here's another pic of my view. During the daylight I'll open the doors and shoot. This rifle is a Winchester Low Wall Musket in .22 L.R. Thanks Six, nice little hide out ya got there. No sweat, Six. Normally, I agree with you, but this particular 94 was my first rifle. My dad saved money all year to buy it for me. While I prefer the pre war versions also, this one is special. The Colt is the first handgun I bought myself. I've had it many years. That thing is neat! Never saw one like that. Now I'm ashamed of the one I made the kid. Thanks Jay glad ya thought it was cool. The Winchester Low Wall Musket.....with the cylinder in the water...65 yards. Last edited by Sixgun on Thu Nov 08, 2018 10:26 pm, edited 1 time in total. Cool beans pard, looks nice there, 17 degrees here and white. Odumbo's high school yearbook photo? Six we used to do the same Capt we would try to hit geese with our 22s from 300 yards! We learned holdover for sure. The pumpkin chunking was great stuff! Some of those catapults throw a 10 pound pumpkin over half a mile! Those guys with the air cannons close to a mile. I wonder what the BC of a pumpkin is?? sight you have on there? 66 Lyman? The Colt? Took another look and it seems like most all of the finish is still on there. Loving care I see....a little holster wear on the ejector housing. I bought one of those many years ago and gave it to my boy which he still has. The gun has a little "pushy" thing a ma jig when you open the loading gate. New Frontier with the adjustable sights. Even wih the sight adjusted all the way to the right it still shot 6" right. I did a backyard gunsmith job on it by unscrewing the barrel about a 1/16" of an inch...cured it. More damm rain for tomorrow and Friday...sick of it! Last month on the news the weather girl said we had a normal years rain fall at the time...early Oct. sick of it, did I already tell ya? I wonder what the BC of a pumpkin is?? Probabbly a lot better than rosie o’dippo. But would be really satisfying to watch her splat after being launched. Would need a much bigger air cannon! The Colt NF is the earlier version without the transfer bar thingy. I have the box, but it was far from new when I bought it. Ive shot it quite a bit and its a super shooter. Sight is nice and center.